Illinois is home to two auto manufacturing plants which provide jobs to thousands of workers in the greater Chicago area. Auto workers are required to perform grueling labor and are fully aware of the dangers and hazards they will be exposed to on a daily basis. In the event that a worker is injured, his or her livelihood may be placed in jeopardy, affecting his or her ability to continue providing for loved ones. The Chicago workers compensation attorneys of Rosenfeld Injury Lawyers LLC specialize in maximizing the amount of our clients’ claims so that they can focus on their physical recoveries without needing to stress over how to make ends meet. If you or a family member was injured while working in an auto factory, you are likely entitled to workers compensation benefits. Contact the workers compensation attorneys at Rosenfeld Injury Lawyers LLC for more information and a free review of your legal rights and options. The vigorous work that auto workers do is not for everyone and requires a lot of lifting, straining and the operation of complex and powerful machinery. There are countless ways a worker can be injured through this work, but most injuries fall into several more general categories. 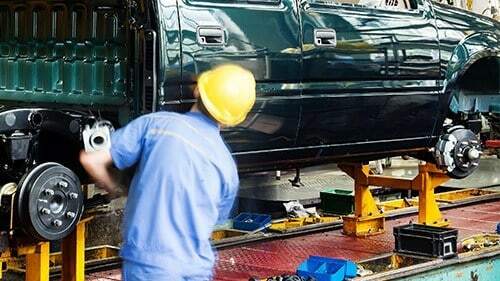 Here are some of the most common types of accidents that our Chicago work accident lawyers handle for auto workers and the types of injuries that might result. Malfunctioning equipment accidents— even the most diligent worker can be thrown off when the machinery he or she trusts to perform a function suddenly acts in an erratic manner or a defect causes the machinery to break down. Since the machines auto workers rely on are powerful, the injuries that result from these accidents can be catastrophic and include broken and crushed bones, trauma to the head, neck or spine or the loss of limbs and digits. Falling object accidents— if can be difficult to see in all directions at all times while operating complex machinery. This is why falling objects can be so dangerous in a manufacturing setting, as workers have very little time to react to the hazard. Trauma to the brain may also result in the loss of cognitive function over time, which may impair the worker’s ability to continue enjoying a normal life. Repetitive use accidents— workers are taught the correct lifting technique in order to reduce the chance they will injure themselves, but when lifting is an integral part of the job, it is possible for repetitious lifting to take its toll over hours, days or years. While injuries to the back, joints and feet are common, so is the development of carpal tunnel if the worker is required to constantly use his or her hands. Amputation or disfigurement— when a limb becomes caught between moving parts, the results can be truly tragic. The loss of an arm, hand, leg or foot is demoralizing physically and emotionally and the worker may have trouble coping with the loss and how it will impact his or her life. Most of the workers who lose a limb or digit in an accident worry about how they will continue to provide for their families. The good news is that the law requires employers to provide benefits to these employees even if the accident was their fault. Since most employers obtain insurance to cover the costs of providing compensation to their injured employees, the insurance companies often pressure them to find ways to limit the amount of compensation paid to those who have been injured. While it is against the law for employers to deny employees benefits, many injured workers are unaware of their rights and may accept settlement offers that are not in their best interests. The distrust many people have toward how their employers handle this process is exhibited in the fact that 85% of injured workers now seek legal representation prior to filing worker’s compensation claims. Rosenfeld Injury Lawyers LLC is an award winning legal firm that has helped thousands of individuals recover the maximum amount of compensation the law allows for their worker’s compensation claims. Our ability to explore multiple legal avenues and negotiate with employers and insurance companies will ensure that you have the greatest chance of recovering every bit of compensation you need to be able to pay your medical bills and out of pocket expenses while continuing to make ends meet. Contact us today to arrange a confidential risk free consultation with one of our highly qualified Chicago workplace injury attorneys. We will gather all of the information we need to thoroughly evaluate your claim and answer all of your questions so that you know exactly what you can expect. In order to be able to provide top notch legal services to everyone regardless of their financial means, we offer our services on a contingency fee basis only. This means that we will never accept payment for our services until we have been able to secure compensation on your behalf, and if we fail to do so, our services will be free of charge.